Our grey aluminum doors and windows. This new build development with character in Priority Street was for a very good commercial customer of ours. It involved us installing our grey aluminum doors (single and double) and windows as well as some curtain walling. This is a customer for whom we have carried out a lot of work across the South East. For many of them we haven’t got photos of so we haven’t written up case studies, however one of the projects we carried out for them was these two grand new build homes with our Residence 9 windows. As with all of their other projects, the tender arrived with us and our estimator David got straight to getting everything quoted. As we have collaborated with this customer for so long, we know how each other works, which means we work well alongside one another and any queries anyone has are always answered quickly. As always, we made sure that all of the grey aluminum doors and windows would comply with all of the necessary building regulations. These include Part L, Part M and the recently introduced Part Q, which ensure that new windows and doors comply with relevant energy efficiency, security, fire egress and toughened safety glass requirements. In terms of aesthetics and for the overall design to work, the right windows and doors was crucial, both in terms of colour and frame thickness. The combination of colours on the exterior meant that picking the right RAL colour was not as easy as in some other new build developments. In the end, a dark RAL 7016 Anthracite Grey was chosen, which is now one of our most popular colours along with black and white. 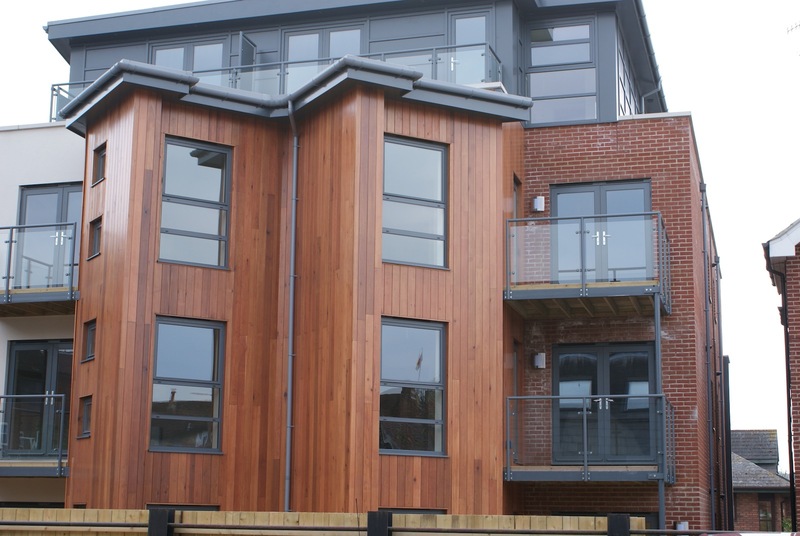 This development features our Smart Alitherm Plus single and double doors along with our Smart Alitherm 600 windows and Senior Architectural SCW aluminium curtain walling. Everything was ordered and our surveyor Terry measured everything up in two or three visits, as the building was being built and not all apertures are ready at first visit. From everything being ordered, around 6 weeks later, the grey aluminum doors, windows and curtain walling were installed over a 3 week period.